When I first started cloning, I feared inserting a DNA fragment into the middle of a gene, such as inserting the EGFP gene into between 96 Leucine (L) and 97 Phenylalanine (F) of Gene A (Fig. 4.1). Insertion here means that EGFP enters into between 96L and 97F without adding any additional nucleotides. When you are extremely lucky (as lucky as winning the lottery), a unique restriction site might fall between 96L and 97F. However, I have never been that lucky. What then can be done? It’s simple. Use PCR. 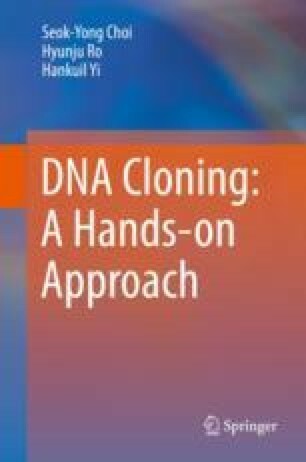 As mentioned before, cloning has become much easier with the advent of PCR.